- all used python modules should be mentioned by a `requirements file <https://pip.readthedocs.io/en/1.1/requirements.html>`_ placed in the root directory of the repository (It is called `requirements.txt <https://gitlab.com/scheunemann/website/blob/master/requirements.txt>`__ for this project). You can already merge all three sections into one YAML file called .gitlab-ci.yml, add it to your root of your project and push it to the remote repository on Gitlab. The output under "CI/CD :raw-html:`&rarr;` Pipelines" will look like the following, with the job "build website" still running. 1) the job gets assigned to the stage "deploy"
I made those variables only accessible to my protected branch master. Otherwise, everybody with access to another branch might be able to adapt the YAML file and retrieve my FTP password with putting `echo $FTP_PASS` one of the jobs. 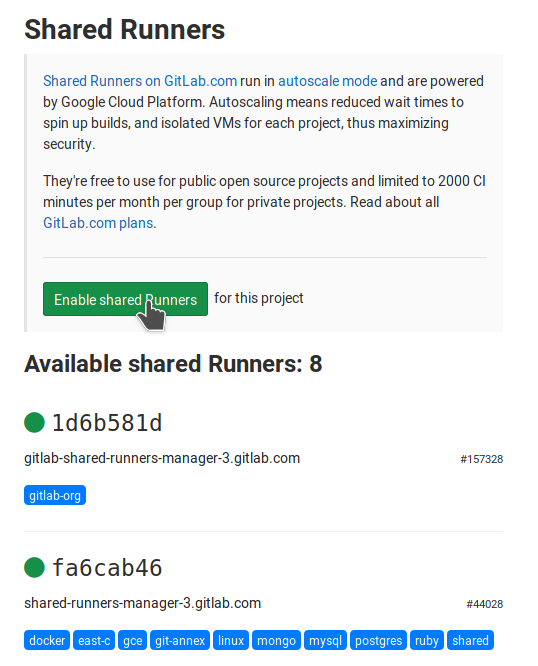 The full script as described here can be found in my website repository: https://gitlab.com/scheunemann/website/blob/6331d62b6b93ac573e8d3198c19d9bcfc57af7a0/.gitlab-ci.yml.